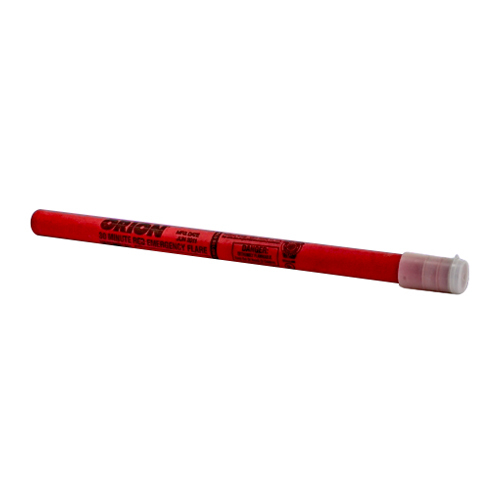 Flares feature an eco-friendly formulation that contains no potassium perchlorate. They're also coated with a light wax seal, making them more durable. UL912 compliant. What is the shelf life for these flares? Please see the following answer from Orion, the flare manufacturer. "Flares are a safe and stable item to store. The U.S. Departments of Transportation classifies flares as a flammable solid, but they are not particularly sensitive to initiation. There is no threat of mass explosion, nor is there any threat of an individual flare exploding. Flares should be stored in sealed bag, away from flame and heat. Failure to store in sealed bag will diminish flare performance. While flares have no expiration date when properly stored, storage above 120 degrees F for a long period of time (more than 1 week) should be avoided. The normal recommended storage temperatures are 40 degrees to 90 degrees F."